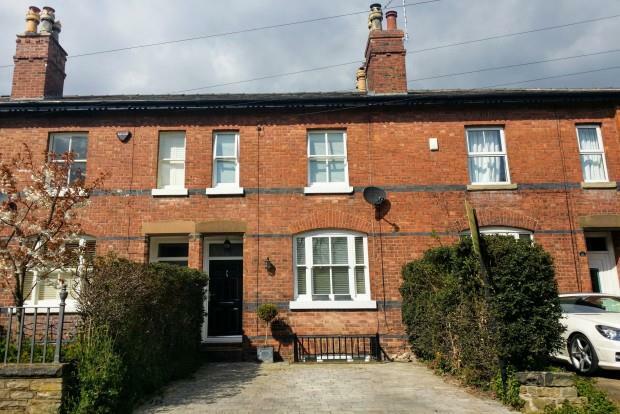 3 Bedroom Terraced House To Rent in Alderley Edge for £2,050 per Calendar Month. This period property is set only a short walk into Alderley Edge Village where you can enjoy some of Cheshire' s finest bars and restaurants. The property itself has been well planned with an extremely high attention to detail, nothing has been missed off the wish list. As you walk through the property you feel like you are entering a boutique hotel with high quality solid oak floors and exquisite fixtures and fittings all entwined together to make this feel like a brand new home with period features. The property briefly comprises; Off road parking for one car, entrance hall way, family reception room with log burner, dining room with dining table and chairs. The newly fitted modern kitchen has ample wall and base units, integrated Fridge/freezer, electric over and gas hob. To the rear you will find a useful purpose built utility housing washing machine and separate dryer, leaving space for storage. Moving downstairs to well designed converted basement, you will find the third double bedroom, complete with three piece en-suite shower room, and built in storage. To the first floor you will find two double bedrooms, the master bedroom benefits from bespoke fitted wardrobes, beautifully crafted wooden dressing table, and two bedside tables, whilst the second bedroom also benefits from fitted wardrobes and two single beds. Completing the property is a four piece family bathroom with walk in shower cubicle, free standing bath, WC and sink unit. Externally to the rear you will find parking for three cars and a patio garden with bistro style table and chairs. Double glazed and gas central heated throughout. Available beginning of June. Call Bridgfords lettings on 01625 441512 to arrange your next viewing. Traditional yet modern family home. Converted basement with En-suite shower room. Newly fitted kitchen with appliances. Walking distance to Alderley Edge.